(Another bittersweet email across the transom, with a very positive ending. To any other bloggers, pundits, talking heads, whatever it is that we are out there reading, when you see your email box and your comment boxes filling up with people wailing in despair, being scandalized, and even declaring that they are “done” with the One True Church, understand that the reason these people are being scandalized and lost is because what they are being told, namely that Jorge Bergoglio is the Pope, is a FALSITY. IF Bergoglio is the Pope (which he obviously isn’t), then Jesus Christ is a liar, a jerk, or both, and if that is the case, then Jesus is not God, and if He is not God, then we are not saved, and the Church is a joke and has been for these 2000 years. When people come here, including the priest below, they hear the Truth – the ugly, unvarnished Truth. Bergoglio is now and always has been an Antipope, and Pope Benedict XVI made one of the biggest errors in the history of the Church, but Pope Benedict is now has has been all along the one and only reigning Pope. Our Lord’s promises have not been broken and His divinity not brought into doubt any more than His Passion and Death on the Cross, horrific as it was, impugnes His Divinity. But the thing about the Truth is that it is always beautiful, edifying and sanctifying, precisely because it is a constitutive quality of God Himself, and thus we know that even the ugliest truths are pointing to, illuminating and guiding us toward Infinite Goodness, Beauty and Love Himself. 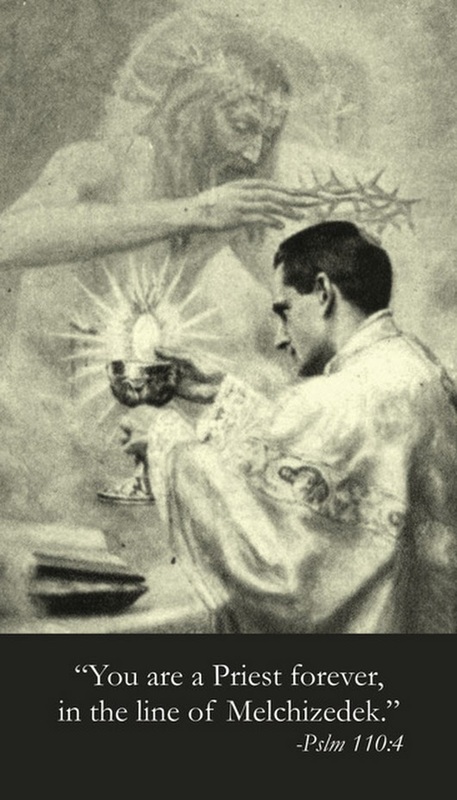 And so, there will be one MORE Holy Sacrifice of the Mass offered every day that was just a few weeks ago was going to be lost. And today that Mass will be offered for my Benefactors and Supporters. And every day here forward, instead of a lost vocation, instead of a priest who, beaten down by the lie of the Bergoglian Antipapacy and Freemasonic-Communist-Sodomitical infiltration of the Institutional Church, threw up his hands and said, “Screw it! I’m done!”, there will be a vivified, quickened, virilized priest offering the Holy Sacrifice in the Venerable Rite of Pius V, and praying the Divine Office, offering up the Sacrifice of Calvary and the Sacrifice of Praise in adoration of Our Thrice Holy and Infinitely Good God, for Holy Mother Church, for the Poor Souls in Purgatory, and for Poor Sinners, that would have been lost to scandal and despair had the priest below not heard the TRUTH about Pope Benedict and Antipope Bergoglio and the satanic infiltration. I just had to write to you in thanks for the difference that your work has made in my life over a very short time. I stumbled on to your blog just a few weeks ago and I believe that God has used this as a means to bring me back in, and be ready for what He wants me to do. Let me explain just a bit. I am a priest of the Diocese of [redacted] (or is it Sodom; hard to tell the difference). I left ministry some months ago, completely of my own accord. I just couldn’t take it anymore. At least one of the priests I lived with was a sodomite. The “pastoral plan” of the diocese constantly gets in the way of God’s work, and honestly suppresses the preaching of the truth (I was once reprimanded for preaching against sodomite marriage because someone who hadn’t darkened the doorstep of a church in years was offended). Obviously, the state of worship was horrible. I have not celebrated the Novus Ordo since leaving public ministry, and I never will again. Over the last six months that I was in the parish, I found myself deeply depressed, and just in generally bad shape. The past months have been difficult. My health has improved greatly. I got myself into shape. I started praying the Old Office, and was very faithful to daily Mass. However, I am ashamed to say that over the summer, my anger towards the earthly leaders of the Church, particularly my own bishop, [name redacted – a notorious sodomite protector and enabler] led me to resolve that I was completely done with my priesthood. Then I stumbled on your blog. I had forgotten that there really are true believers out there. Even in my own family, people typically want to take the path of least resistance, and prioritize the retention of the material wealth of the Church (or what little is left of it), at the expense of proclaiming the truth loudly and boldly. I read what you write, listen to your podcasts, and watch your videos, and I see a person who is unafraid, and who I would say has the heart of a child who is completely in love with Christ, Who is the Truth. I feel as though my relationship with Christ must be very similar to yours, in that we are attracted to the Truth. I also didn’t realize that there was anyone else who could see the truth about the economic and political situations. Let me say that I have learned a great deal from you concerning economics, and also theology. I say that as someone who has received a solid Thomistic theological education. Also, thank you for telling the truth about Islam, and about sodomites. I have gone on too long, but I just wanted to express my most profound thanks. Please let me know if you need Mass celebrated for any particular intention. If I can be of any help to you, I would be honored. I will celebrate Mass for your intention tomorrow (Sunday, 23 September, 2018), and promise to pray that your courage will endure. This entry was posted in Uncategorized on September 23, ARSH 2018 by Ann Barnhardt.